EVO COMFORT scooter with seat; all-in-1 product for children 15m to 9+! Why buy 3 different products when you can get a pushchair, walking bike &amp; scooter all-in-one? EVO COMFORT delivers 3 different modes for maximum product usage without compromising on safety, style, and comfort! It comes with an extra-wide seat and a seat support bar which simultaneously moves the seat upward and backward in 3 different heights, making this product the champion of comfort. This toddler scooter also has a removable footrest to avoid shoes dragging on the ground in pushchair mode. #Bonus! What’s more, all our EVO COMFORT scooters with seat come with our patented steering lock button which prevents the front wheels from turning left or right for easy learning and a 4-height adjustable T-bar to be used by children up to 9+! EVO COMFORT PLAY; unique developmental scooter to stimulate senses & develop motor skills. The best toys for children are toys which provide children opportunities to learn and engage their senses. That’s why we’ve gone one step further and designed EVO COMFORT PLAY. It keeps all the essentials of our standard EVO COMFORT and offers an exclusive light & sound module in the seat’s handlebar. 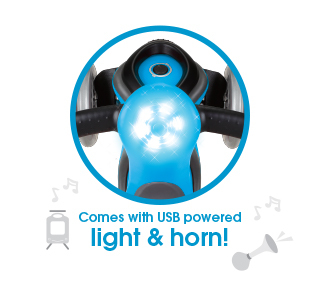 The module not only brings fun and integration, it also stimulates your child’s senses thanks to our integrated light module which flashes in the same colour as your scooter and in-built horn which has 6 different sounds. EVO COMFORT: Standard 4-height adjustable scooter, extra-wide seat with 3 heights & footrest. EVO COMFORT LIGHTS: Standard version + light-up scooter with battery-free LED wheels. EVO COMFORT PLAY: Standard version + light & sound simulation module for your child.